Social & Sport Contribution Fund CEO Abdulrahman Abdulatif al-Mannai (left) and QREC CEO Nasser Sherida al-Kaabi at a press conference yesterday. 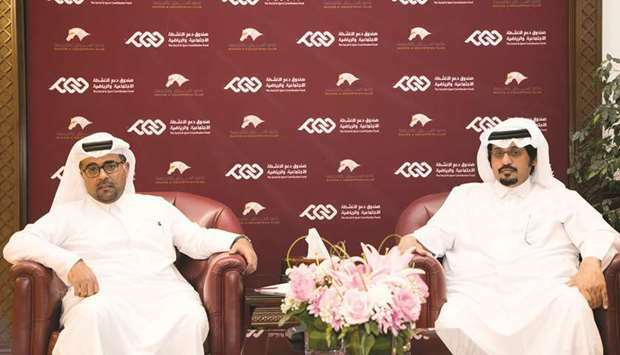 Doha: Social & Sport Contribution Fund (Daam) expressed happiness with their three-year-old partnership with the Qatar Racing and Equestrian Club (QREC) as one of the main sponsors of the His Highness The Amir Sword Festival. “We are happy with this partnership with the club because all the activities they organise are at a high professional level. We believe that this sport really represents the Qataris. It is part tradition, part culture, and it is part commercial as well. So for us, it ticks all the boxes. And we are excited about it, and we are hoping to see it develop even further,” Social & Sport Contribution Fund CEO Abdulrahman Abdulatif al-Mannai said at a press conference at the QREC yesterday.